With more than 70 craft breweries spread across the state (and new ones opening seemingly every week), it’s no secret that New Hampshire is home to some great beer. To help you get to know some of the Granite State’s favorite sudsy spots, we’re implementing a new series of “Meet the Brewer” profiles to introduce you to our top-notch New Hampshire breweries and the men and women behind them. For our latest profile, meet Rick Horton. Rick is the owner and head brewer of The Outlaw Brewing Company, a small 450 square-foot taproom that’s been operating in the fields on Winchester since June of 2017. Read on to learn all about the 200-500 barrel-per-year capacity facility and their head brewing honcho. NH Magazine: What is your title at the brewery? RH: I’m the owner, head brewer, janitor, delivery guy and whatever else has to be done. NHM: How did you get into the brewing business? RH: A hobby gone wild. I have homebrewed since the '90s and finally do it for a living. NHM: Why did you choose to work in New Hampshire? What do you appreciate about the craft beer scene here? RH: I was born and raised in New Hampshire. The infancy of the beer scene in the area is the most exciting. We have a lot of room to grow! NHM: What style(s) of beer are you personally most fond of? RH: Classic styles are my types of beer. I tell people often that I am not here to reinvent beer. I am here to brew classic drinkable beer. Our beer is beer, start to finish. NHM: What’s your personal favorite of the beers you make? RH: My personal favorite is our English brown ale. It’s a recipe that I crafted back as a homebrewer and perfected it over time. It’s a true brown ale that is lightly hopped, lightly carbonated and smooth with just a little hint of nut and chocolate. NHM: What is your annual production size, in barrels? RH: This is a tough one to answer. We grow organically and are small enough that we can shrink and swell. So, in a vague answer, I would project us at a 200-500 barrel-facility. NHM: When did you open to the public? RH: Back around 2011 I began this journey by contacting the state and getting answers I didn’t want to hear. They told me it couldn’t be done in my current location. I put the dream to rest, then went through with a divorce and came days from losing my property to foreclosure. After years of rebuilding and starting a new life with my new wife, I was able to rebound. I had saved the property from foreclosure and was able to maintain until the economy started to rebound. Two years ago, we broke ground and began making this dream a reality. In May of 2017, we received state and federal approval and began production. In June of 2017, we had our first delivery day. From that day forward we grew weekly, constantly trying to keep up and stay small. NHM: What sets you apart from other New Hampshire breweries? What’s unique about your style or mission? RH: I have been asked this many times and have finally narrowed down what really makes us unique — it’s because we are truly small and local. We are a husband-and-wife team building a family business for the future. We welcome our customers as part of our family, and we have a very grassroots attitude to what we do. We are not a company run by investors — we are company run by a man with a dream. I am closer to the beer than most owners are. I not only brew the beer and pay the bills but I deliver it. It’s important, and is a key part of our vision, to allow our customers (wholesale and retail) to be the people that are helping make their dream come true. NHM: How many beers and what styles do you offer at any given time? RH: Currently our tap tower has eight lines; we try to keep a wide variety. NHM: What’s your most popular beer? RH: Again, that is a tough question. If we are looking at sales as a whole, we sell more of our American blonde than any other of our brews. But in the taproom, it is always an even mix. If I were to pick one I would say our iced coffee blonde is most popular in the taproom. NHM: What’s next for your brewery? RH: Well, we just finished our first Airbnb at the residential property next door. We wanted another way to share the space and the experience for travelers far away. We will continue to grow and expand organically as we have several customers coming on board and a 6-bbl system in the making. We are small, and what that requires us to do is to be innovative. We build most of our equipment and do our best to keep costs down on the production side so we can continue to keep costs down on the wholesale and retail side. NHM: Where can your beer be purchased? RH: We have over 25+ restaurants and 6+ retailers that sell our beer. We are available from Winchester to Dover, New Hampshire. Our social media (Facebook, Twitter) is the best place to find our where we will be next, or what will be our next brewfest. 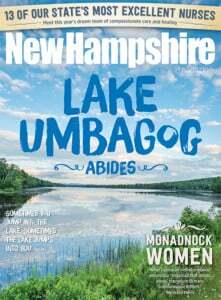 © 2019 New Hampshire Magazine.